As an auntie of Lego fans and mommy of a future Lego fan, I totally fell in adoration with this room. When Savvy Baby is ready for a big boy room, this gal will have so much fun decorating, with his help of course. 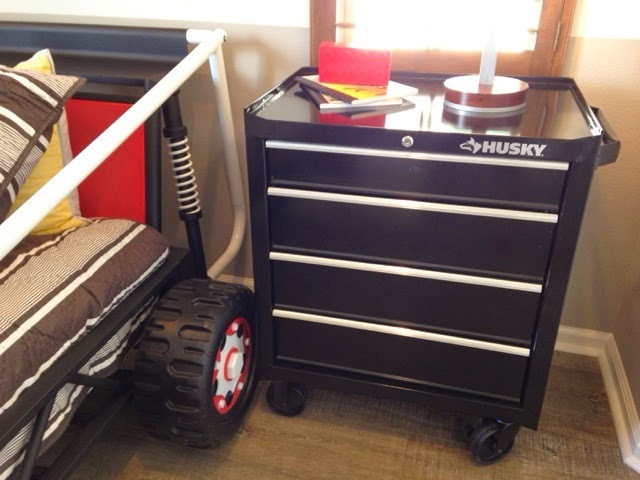 Thinking outside of the box, instead of a traditional side table, this designer used Husky tool chest (ONLY $109 each) as bedside table which will fit any car/plane themed room. When it is no longer needed, these can be recycle as tool chests in the garage. 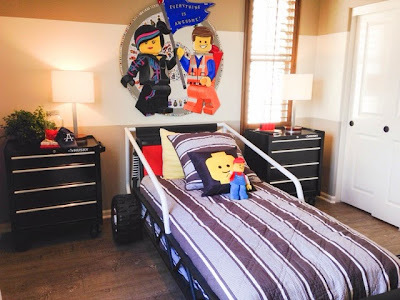 This Lego themed car bedroom is not too difficult to achieve. It is cute without going over the top. To further enhance the Lego theme, I would glue Lego pieces around picture frames for the wall and on the tables. Or, use Lego :pieces to spell out a name or words on the wall. What is your dream theme room?